While the big girls and Daddy were skiing in Breckenridge I spent time ﻿walking the town in search of distractions. The first day of skiing I took advantage of the warm sunshine to explore the town on foot. Breckenridge has plenty of shops to explore. I found all sorts of interesting things. For example I went into a great loose spice store. There I found amazing spice blends as well as a fantastic assortment of loose tea. I enjoyed myself looking at all the spice and tea blends. After making a purchase I walked out of the side door only to discover that this nice spice shop shared building space with the local cannabis club. Until that point I had forgotten that Colorado voters passed amendment 64 which legalized the use of medical marijuana. After that I paid more attention to what buildings I was entering. Oh silly Colorado voters you and your amendments. On Friday I took the gondola up to Peak 8 to have lunch with my skiers. I brought some sandwiches and other snacks. When I began my journey up to the peak the snow clouds were rolling in. After lunch the snow was just beginning to fall. I decided rather than drive back to the house for 2 hours I'd go find something in town to keep me busy for the afternoon. I have always wanted to paint pottery so when I found the local paint your own pottery store I felt it was the perfect time to give it a try. When I stepped in to Ready Paint Fire the store was busy with some people. A few were painting on canvas, others were painting some mugs, and one woman was working on a mosaic pottery box. I was pleased to see the place full of activity on a Friday afternoon. After I was welcomed and shown my options I settled in to a table right by the door. There I searched for a piece of pottery to create something useful. 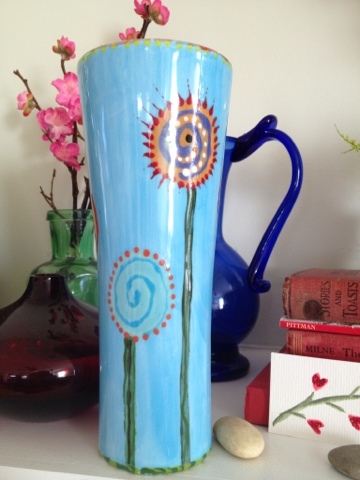 First I painted a pilsner mug, which at first I thought was a simple vase. I'll be using it as a vase but at least I have options! After the vase I didn't have much time left before the ski lifts closed for the day. 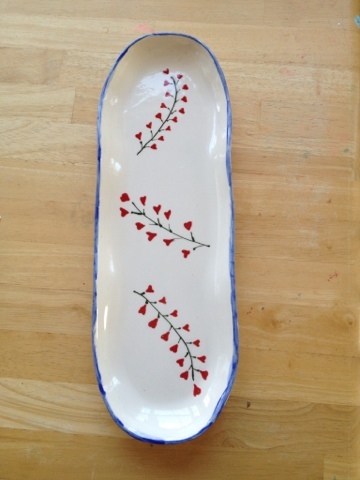 I chose a small platter to paint. I searched the shelves for perfect sized platter. I do love platters and the bigger the better. However big I'd like my platters to be I do need something smaller. We enjoy having tapas nights for supper. Mmmm tapas. With tapas in mind I found this little platter. A decent shape and size I set to work painting it. Since I plan to serve food on it I didn't want to paint the platter with too many colors. I kept the design simple. And...I was a bit rushed since I took too long finding the platter I had to hurry my painting along so that I could be at the lift to pick up the family. I was very happy to see my pottery pieces all complete. Now that they are home after safely surviving the carry on luggage I can't wait to put them to use.